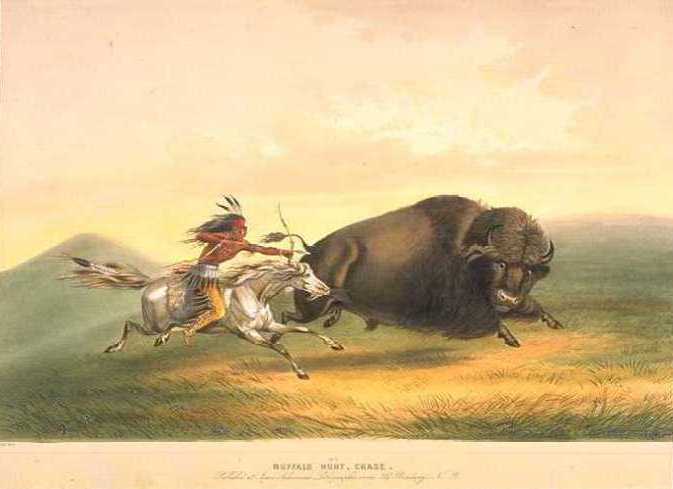 Image courtesy of: The Illustrating Traveler, Yale University's Beinecke Rare Book and Manuscript Library has several beautiful images of the old west. Howard Egan wrote: "The morning was very pleasant. I stood guard the later part of the night, in the place of some of the brethren that have gone ahead. About 3 o'clock this morning I commenced cleaning the fish Brother Clayton caught. I fried them and we had a firstrate breakfast. This is the first place I have seen since we left Winter Quarters, where I should like to live. The land is good and plenty of timber and the warbling of the birds make is very pleasant." Thomas Bullock wrote on a skull a message to the next company and also planted a hill of corn as he had been doing for some time. The pioneers traveled along the North Platte river bottoms all day. They rode their horses into the river several times to see if they could find a place to ford, but the water level was too high from the melting snow in the mountains. Appleton Harmon wrote: "No timber, only now and then a few scattering cottonwoods, in groups along the river. At times we changed our direction to wind around some ravine that sits back from the river, or some gutter that had been washed by the heavy rain in the sandy soil which was but partially covered by grass and wild sage." William Clayton put up a guide board indicating that it was one hundred miles from Fort Laramie. Some of the brethren had started to taken an interest in his guide boards and helped him to find good wood to be used for the signs. They camped in a cottonwood grove, after seventeen miles, near two or the three Missouri companies, who were trying to ferry over their wagons with their skiff and newly constructed rafts. Thomas Bullock observed: "The two camps half a mile off make more noise by ten times than all our camp put together." The emigrants told the brethren that the advance company of pioneers were working a ferry crossing ten miles further up the river. One of the emigrants brought a snowball to camp. They had been up the mountains and reported the two or three bears had been killed by their company. Orson Pratt learned about an accident that happened in one of these companies. "The day before their teams took fright by the running of a horse, upsetting two of their wagons: one woman and two children considerably injured, but no bone broke: some crockery, broken." The hunters had great success. They brought in thirteen antelope. The Missouri company killed three buffalo. Appleton Harmon described the surroundings: "There is a range off to the black hills or mountains extending in a long parallel with the river from two to four miles distant and most of which is thickly covered with evergreens, mostly cedar, and at this time is partially covered with snow which can be distinctly seen from the camp." The advance company of about forty men arrived at the ferry crossing in present-day Casper, Wyoming, four hours ahead of any of the Missouri companies. They could not find the boat made from hides that had been left behind by a company of traders. Soon, some of those from the Missouri companies arrived. One of the men of the Missourian company tried to swim across the river with his clothes on. When he reached the current he became frightened and began to moan. Some of the pioneers went to him with the "Revenue Cutter" and reached him in time to save his life. While camped at Lodgepole Creek, about fifteen miles north of the present-day Wyoming-Colorado state line, the detachment from Pueblo met Amasa Lyman, Roswell Stevens, John Tippetts, and Thomas Woolsey. They had been sent from Fort Laramie by Brigham Young to bring these Saints to follow after the pioneer company. Amasa Lyman delivered a large package of letters to the battalion from their families back on the Missouri River. John Hess, a member of the battalion wrote: "This was indeed a happy meeting to get new from our loved ones and it greatly relieved our anxieties as we then learned that the camp ahead of us led by President Brigham Young and he lead by revelations, so we pushed on with fresh courage." Joel Terrell was somewhat miffed at being charged postage for the letters from home. "At any rate it gave us another chance to part with one dollar more of our hard earnings . . . it was joy and grief to me." Mary Richards spent the day saying good-bye to several families who were about to leave in the next pioneer company. She wrote: "May the Lord bless them and bring them to the end of the journey in Peace and safety." For some time, Eliza R. Snow and other sisters had been participating in sacred meetings at which the Spirit of the Lord would be in great abundance and spiritual gifts would be experienced. In the afternoon, such a meeting was held. Sister Snow wrote: "We had a glorious time -- Sis. Leavitt & M[argaret] Pierce spoke in the gift [of tongues] & I could truly say that my heart was fill'd to overflowing with gratitude to my Father in heaven. An express arrived from Monterey with some letters from the Kearny detachment. Orders were read from Colonel Mason, now governor of California. One of the orders was related to the case of John Allen, a battalion member who joined the Church at Fort Leavenworth and signed up with the battalion to go to California. He had been in jail for deserting his post as a guard. He also no longer belonged to the Church. He had been cut off by a Quorum of 70's at Los Angeles for drunkenness, swearing, and other vices. Henry Standage believed he had never really been a Mormon, showing a bad spirit for the whole journey. The order stated that his sentence should be to have half of his hair shaved and to be drummed out of town. Elder Addison Pratt arrived at San Francisco after a long voyage from his four year mission to the South Pacific. When he landed, he met many of the Saints who came to California on the ship Brooklyn. He discovered that their leader, Samuel Brannan was away to the pioneers, hoping to guide them to California. Elder Pratt wrote: "I soon found there was much dissatisfaction among the Brooklyn brethren as to Brannan's proceedings while on board of the Brooklyn, and several of them proposed to me to take charge of the spiritual affairs among them. But I told them it was not my place to meddle with their affairs in any wise as Brannan was the man that was appointed by the church to look after them, and my mission was to another part of the world altogether." As the detachment traveled toward Sacramento, they came across some Americans. They learned that a letter had been received from the Church and that Samuel Brannan had gone back to pilot them through the mountains to California. In the evening, they met Brother Thomas Rhoads, who with his family had been the first Church members to emigrate overland to California. They had arrived in October, 1846 with the Lilburn Boggs company. He told them that there were Church members settled in several different places through the area.